Producers: S. Mabuse & Richard Mitchell. 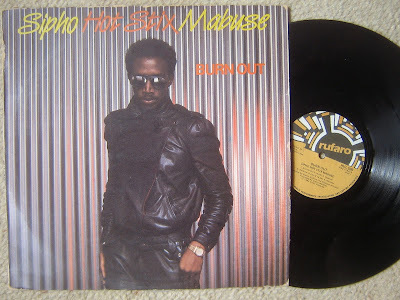 Possibly the biggest and most endearing pop song in SA music history, the title track is the perfect mix of disco-funk and township jive beat. 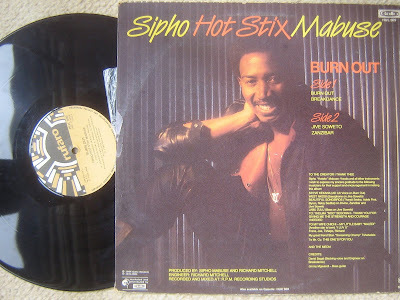 It sold over 500 000 copies and enjoyed massive dancefloor success amongst South Africans of all backgrounds. It even sold in the UK, where it was released by Virgin. The title track resurfaced a few years ago on a Chicken Licken ad, although really it had never left. Besides the title track, the four-track album also contains the perennial hit “Jive Soweto,” the vocoder-drenched “Breakdance,” and the comparatively forgettable “Zanzibar”. The album features contributions from prominent musicians like Jimmy Mgwandi (bass), Steve Kekana (vocals), West Nkosi and Jabu Zulu. Hotstix credits everyone from his wife, god, Stan Screamer Tshabalala and the media. The cover art is priceless: a picture of Mabuse in aviators and killer leather jacket, with space-age red and yellow colour scheme. I’d rather not go into what I had to do to get this album.